Since 2003, Floatleft has been providing professional and affordable web development solutions to social change nonprofits. We do this work out of our desire to help organizations more effectively achieve their missions. We're passionate about serving our clients' missions and provide a hands-on approach to development and implementation. We specialize in Drupal, an open source content management system, but also have built beautiful sites with WordPress. We do more than just build sites. We build capacity, handle complex integrations and content migrations and provide custom coding. Send us an email or give us a call. We're happy to take the time to talk through your project goals with you at any time. Do you have a project that you'd like to talk with us about? Below are our core services. We do much more, so if your project has requirements that aren't listed here, get in touch and we can let you know whether we would be a good fit to meet your needs. We've been building sites for nonprofits with Drupal since 2004 and have the expertise to solve the most complex challenges while also providing the most efficient solutions. WordPress is a great fit for less complex sites and lower budgets. 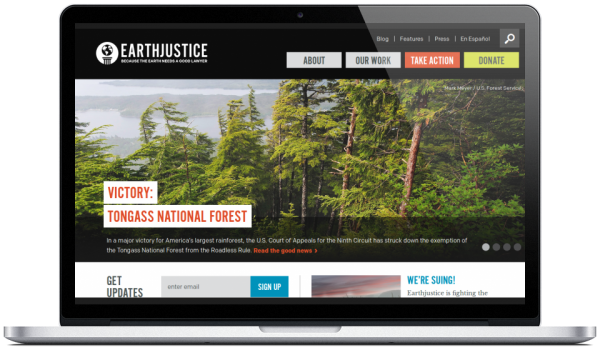 We can either work with design mockups or customize off-the-shelf themes to produce a site that is effective for the needs of your nonprofit organization. We work closely with designers to ensure that the design mockups they create are functional and aren't unnecessarily complex; then produce the code to turn them into fully-featured, responsive sites. Training nonprofit staff on how to effectively use the tools we provide is an essential part of the success of our projects. As your partner, we're here to provide on-going support and answer your questions after your site goes live. We also keep your content management system up-to-date with the latest versions to ensure that your site stays secure. We provide custom coding solutions and have integrated with various APIs and CRM systems. Get in touch to find out how we can help you solve your challenge.